- And the biggest portion of information, which is used daily in business routine, but has never been captured. My conservative estimate of the percentages of structured, unstructured and tribal knowledge is 10%, 20% and 70%. By retiring baby boomers or replacing experienced and expensive with young and cheap workers, corporations actively lose huge portions of tribal knowledge. Not only retirees, but other people leave the company for various reasons, expanding the void in corporate knowledge. Sooner or later the business feels the pain, especially companies dealing with long-life products surrounded by an enormous volume of related rules and regulations. The experienced and expensive would love to share their knowledge, but capturing tribal knowledge is tricky, and formalizing this information is even more difficult. The Conversational Semantic Decision Support (CSDS) system helps to make this challenging task feasible. CSDS will transform the concept of a Corporate Knowledge Warehouse (CKW) into a working system. What is a Corporate Knowledge Warehouse? The CKW is a collection of electronic materials which describe enterprise processes, not only for people but also for a machine. Formalized as the integrated ontology of connected knowledge domains, CKW can be converted into specific formats for specific purposes. For example, CKW can be converted into business rules and scenarios to drive business applications, as described in the Knowledge-driven architecture (https://patents.google.com/patent/US7774751B2/en). 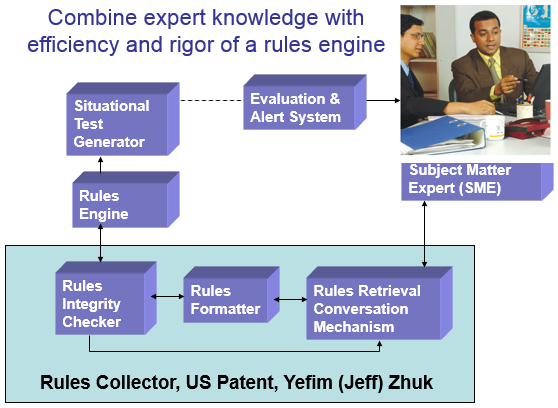 One of the mechanisms for such conversion is described in details as the Rules Collector System (https://patents.google.com/patent/US8051026B2/en). Knowledge workers are often making decisions based on a set of rules that are never formalized but rather accumulated over time as specific expertise in a specific business area. How to capture this tribal knowledge? The Rules Collector (https://patents.google.com/patent/US8051026B2/en) does exactly that. The system helps capturing the expertise of an individual in a formalized manner as a set of rules for a rules engine. This is not artificial intelligence (yet) but a good combination of a computer power with the knowledge of a subject matter expert (SME). The system starts a conversation with a SME following a few initial conversational scenarios. While a SME is trying to describe a situation and related rules, the system tries to translate this information into a formalized knowledge. Of course, this might not be done in one shot. People do not talk XML and their descriptions are not very precise. This is a conversational process governed by the Rules Retrieval Conversational Mechanism. The computer program will continue clarify the descriptions till can transform it into the rules. There are many forms of formalized knowledge. The rules are just one of them. Rules can work directly in a rules engine, the heart of a business application. The most generic form of expressing the rule is a semantic graph. Semantic graphs will represent meta-data or architectural views of information. These semantic models will support conversational scenarios, an important part of retrieving and formalizing information. Semantic graphs will also represent the data. You can see this as a common approach. Of course, conceptual semantic models will be different for different business domains, but they will be represented in the same semantic graph format and could live in the same containers - tools. To successfully compete a company must be aware what is going on in its specific industry. Collecting data is necessary although expensive job. One of the best information companies is IHS Global Inc. which is focusing on engineering. This is another example of using CSDS to increase efficiency and provide Knowledge Delivery as a Service. - Every interaction with users and every new bit of information in knowledge ontology makes improvements in all system components. - Conversational scripts not only help users, but also help growing knowledge domain ontology, enhance conversational scripts, makes more precise definition for collecting data from public sources, which in its own turn improves ontology. There is an opportunity to grow a Knowledge Tree into a Global Knowledge Marketplace by collecting the tribal knowledge of individuals, their experience, stories, scientific and emotional context. This relatively new area of integrated software and knowledge engineering opens new horizons to application development. The industry started its heavy turn to Big Data and Business Intelligence demanding a new set of skills. Most of the related products and tools are written in Java programming language. On the top of Core Java, application developers need to learn more about Semantic Technology and have exposure to Enterprise Services with Artificial Intelligence (AI) compnents. It is extremely important for developers to be able come closer to the business side of the story, ideally becoming Business Architects, who understand a bigger picture. Internet Technology University (https://ITUniversity.us | https://JavaSchool.com) teaches these skills via AI Training Platform. ITU provides access to Business Architecture Sandbox for Enterprise (BASE) described in the book, IT of the future. BASE works as a playground filled with the latest enterprise technology toys, including AI components. BASE facilitates business and IT collaboration and encourages placing the seeds of new technologies in the current business ground. One of the goals of ITU is to grow a new generation of AI Consultants and Entrepreneurs while using AI components in the process. Internet Technology University (ITU) focuses on Accelerating Sharing Knowledge with Conversational Semantic Decision Support (AskCSDS AI) systems. ITU uses AI components to engage students in group discussions and teaching. 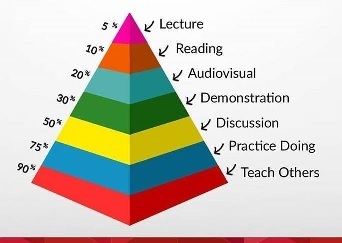 To help teachers and subject matter experts share knowledge in a highly structured and productive manner. Become an AI student at ITU or make a gift to your friend or family member. Contact ITU for your privileged access. Ask for a discount for a small team of two. Start learning AI and become an AI Consultant at ITU.